38" Tall, Weighs 24 lbs. 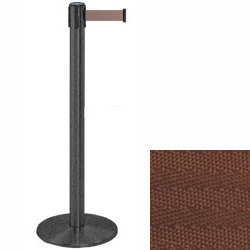 These black stanchions with brown belt are a great for forming lines, barricades and room dividers in any industry. Each post is made of strong metal and features a wrinkle finish that blends in with other décor. 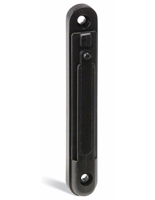 The black stanchions' belt has a nylon fabrication and measures 13' in length. 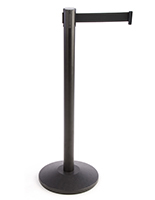 In addition, the poles come with a 4-way adapter that allows up to three other stands to link to them. 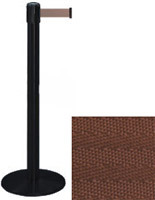 This type of black stanchion is excellent for retail stores, restaurants and convention centers where they can organize crowds and direct them to their destination in an orderly fashion.